When establishing a plantation, it is important to select tree species that are suited to the climatic conditions and soils at the planting site (Boulet et al. 2009). According to Ostry et al. (2010), white pine behaves better on nutrient rich mesic soils with a fine sandy or sandy loan texture. 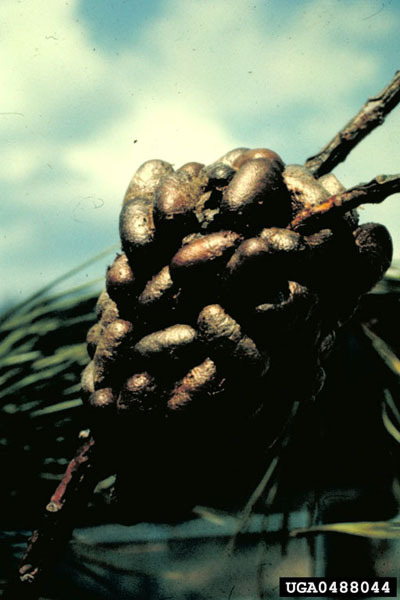 However, as competing species are favoured by these conditions, it is preferable to plant white pine or poor to medium rich, dry to mesic soils. White pine has an intermediate tolerance to shade and this tolerance varies with age. The vigour of pine plantations and stands can be maintained by carrying out release from competing species (Ostry et al. 2010) before the plantation reaches 30 years of age. Ornamental trees can be fertilized in early summer to increase their vigour (Oliver 1980). It is important to use a fertilizer suited for conifers. 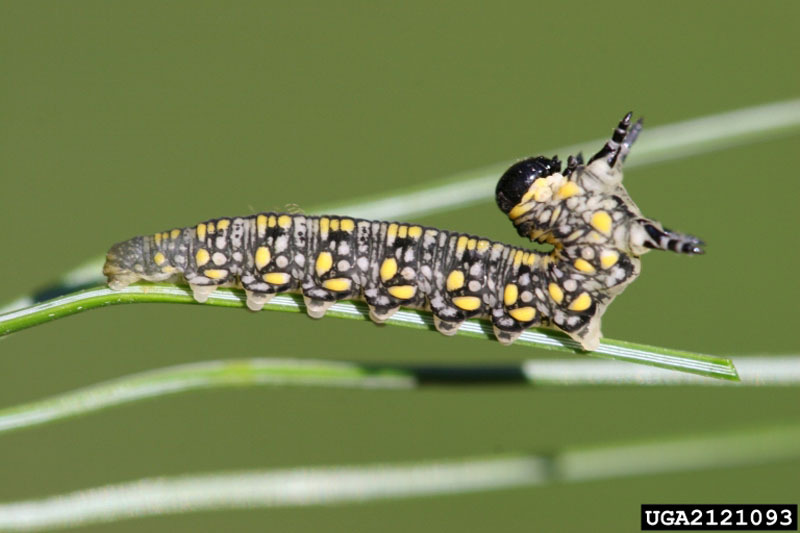 The introduced pine sawfly has two generation per year. The larvae of the first generation can be seen in early June, usually on five needle pines. There appearance is characteristic (IDCF 2011). Current year needles are not impacted. Early detection of an infestation favours a rapid response. 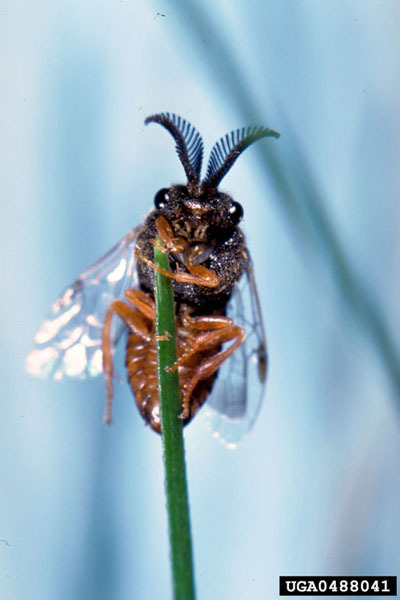 The introduced pine sawfly is a gregarious diprionid sawfly species. Infestations can be controlled effectively with a contact insecticide or a stomach insecticide. Spraying should be timed to coincide with larval feeding: apply insecticide in the first week of June or in the second half of August (Rose and Lindquist 1973; Wong and Tidsbury 1983), or apply sprays when there are 5 to 10 larvae on every young tree (Salom 1996). Insecticides registered in Canada for use against pine sawflies contain acephate, carbaryl, diazinon, malathion, permethrin, soaps (potassium salts or alkanolamine salts of fatty acids) or spinosad. Parasites, predators and cold winter temperatures help to maintain populations at a tolerable level. Diprion similis (Hartig) is a rare species in America (Rose and Lindquist 1973; Wilson 1971). The wasps, Exenterus amictorius (Panzer), and Monodontomerus dentipes (Dalm. ), originally introduced to North America from Europe, play an important role in biological control of the introduced pine sawfly populations (Wilson 1971; Drooz et al. 1979). Although their importance for natural control cannot be assessed, predators such as spiders, other hymenopterous and dipterous parasites (Mertins and Coppel 1973), rodents and birds (especially chickadees) are may occasionally play a key role (Wilson 1971). 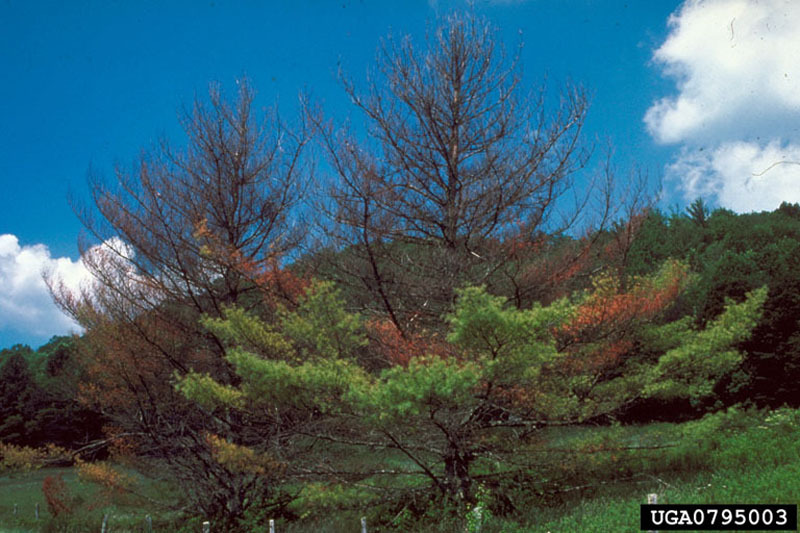 Austrian pine (Pinus nigra Arnold) appears to be resistant to this pine sawfly (Johnson and Lyon 1988). Control measures are required only during severe infestations in plantations. Integrated pest management may also be suitable for infested ornamental trees. Keep trees, plantations and stands healthy by choosing suitable planting sites and by carrying out appropriately timed thinnings. Fertilize ornamental trees in early summer every three to five years, or more often if the soil is nutrient poor. 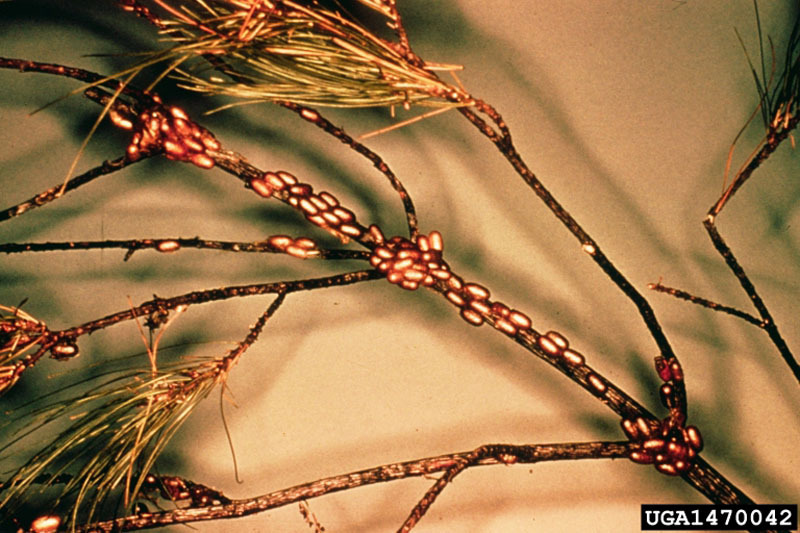 Inspect plantations beginning in mid-June and pay special attention to five-needle pines, which are the most susceptible to injury. Insecticide spraying is effective if the larvae are detected early; otherwise, treatment should be held off until the second part of August when the second generation appears. When more than 5 to 10 caterpillars are detected per tree, it is time to spray. A treated plantation needs to be inspected again around mid-August to check for second-generation larvae. Inspections should be repeated in subsequent years because sawflies have a prolonged diapause. Boulet, B.; Chabot, M.; Dorais, L.; Dupont, A.; Gagnon, R. et Morneau, L. 2009. Entomologie forestière, dans Ordre des Ingénieurs Forestiers du Québec, Manuel de foresterie, 2e éd. Ouvrage collectif, Éditions MultiMonde, Québec, pp. 1037-1090. Drooz, A. T.; Doggett, C. A and Coppel, H. C. 1979. 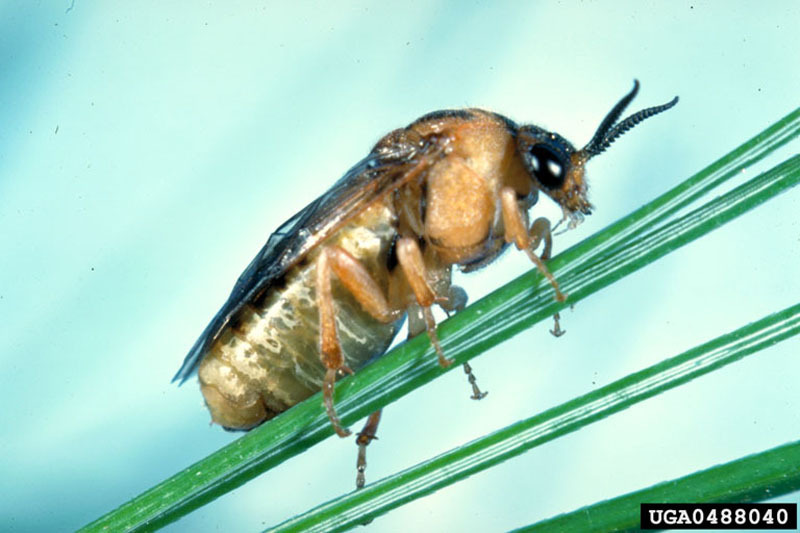 The introduced pine sawfly, a defoliator of white pine new to North Carolina. USDA, Forest service, Research note SE-273. IDCF, Insect and Diseases of Canada’s Forests. 2011. Diprion Similis. Natural Resources Canada, Canadian Forest Service, http://imfc.cfl.scf.rncan.gc.ca/insecte-insect-eng.asp?geID=6552&ind=D accessed in July 2011. Johnson, W. T. and Lyon, H. H. 1988. Insects that feed on trees and shrubs. Second edition. Comstock publishing associates a division of Cornell University press. Ithaca N-Y. 556 pp. Mertins, J.W. and Coppel, H.C. 1973. Adaptation of native and exotic hyperparasites to the introduced primary sawfly parasite, Exenterus amictorius (Panzer) in Wisconsin. Entomophaga 18: I9-23. Oliver, R.W. 1980. La culture des arbres d’ornement pour les jardins canadiens. Agriculture Canada, Publication 994, 31 pp. Ostry, M. E.; Laflamme, G.; Katovich, S. A. 2010. Silvicultural approaches for management of eastern white pine to minimize impacts of damaging agents. For. Pathol. 40: 332-346. Rose, A.H. et Lindquist, O.H., 1973. Insectes des pins de l’est du Canada. Publication 1313F. Centre de recherches forestières des Grands Lacs. Ministère de l’Environnement, Service canadien des forêts. Ottawa. 126 pp. Salom, S.M. 1996. Introduced pine sawfly. Department of Entomology, Virginia Polytechnic Institute and State University, Virginia cooperative extension, Publication 444-237. http://www.ext.vt.edu/departments/entomology/factsheets/intpisaf.html consulté le 4 février 2009. Wong, H. R. and Tidsbury, R. C. 1983. Introduced pine sawfly in Manitoba, Northern Forest Research Centre, Canada, Forest Management Note no. 26.